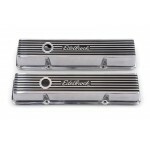 In 2014, Edelbrock introduced their next generation of Elite Series accessories, the Elite II. This new line of accessories features a design that is influenced by the original Elite Series originally released in 1985, but with a new modern take on this classic look. 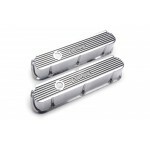 Made from heavy-gauge, die-cast aluminium and finished off with a show quality high lustre polished finish. The raised fins are accented by a contrast gloss black finish between the fins for the definitive Elite Series look. This unit now has a washable filter element. Fits 5 1/8” neck carburettors e.g. 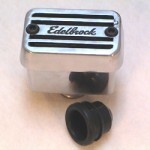 Edelbrock Performer Series, Holley. 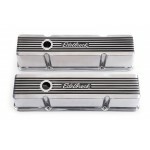 Matches Edelbrock Elite series valve covers (e.g. EDEL4263, EDEL4264). 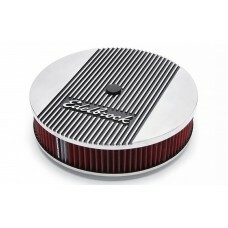 This air cleaner features a recessed base and so will sit lower over the carburettor giving an approximate installed height of 60mm. For our lowest air cleaner use MRG4339.